Jul. 19, 2017 1:00 p.m.
Doug Manderville, a Red Deer resident since 1982, is running for Red Deer City Council and is hoping to bring a unique perspective. 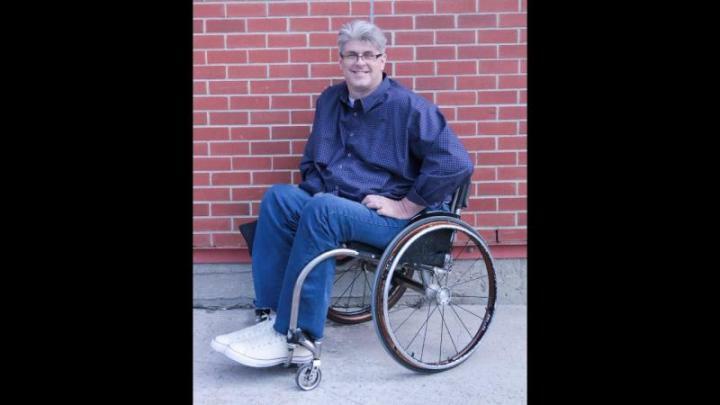 “To my knowledge, there hasn’t been a person with a physical disability serve on council,” said Manderville, who suffered a severe spinal cord injury in 1994. Manderville developed an acronym to portray his electoral platform and how he feels he would contribute to Red Deer City council. He added his experience in the non-profit sector would greatly benefit his work on council. Manderville is wanting to contribute in many more ways then just advocating for people with disabilities. “I am hoping to bridge a gap for the youth. We are paving the way for our youth population. I think City council has done a fantastic job in being transparent with the community and they have recognized young people as the future,” he said. He noted the new compressed natural gas (CNG) buses are an excellent way for Red Deer to ensure they are protecting the younger generation by reducing the City’s carbon footprint. “If you look at new CNG buses – that is a step in the right direction. I would like to contribute to issues like this in the future,” he said. Manderville also included diversity, fiscal responsibility and building a relationship and an understanding with the indigenous population as key factors to his campaign. Infrastructure and managing growth are also things that Manderville sees as key to the next term of council. Managing growth, while still maintaining a friendly, small town feel is what Manderville hopes to achieve. “When we first moved here in ’82, the population was 32,000, so we have definitely seen growth,” he said. “Our infrastructure and services have changed and I think we as a community and the City council have done an excellent job of embracing that growth. “The biggest challenge we face is our growing population, which isn’t necessarily a negative thing. Red Deer is a city, but it still has that small town feeling. He added that the several new roundabouts throughout the City are an excellent example about how Red Deer City council can influence important infrastructure projects. Manderville believes he can be a middle ground on council between left and right ideas. He added it is important to him to be available to his community. “In the non-profit sector, if the phone rings on a Saturday and somebody needs something – I’m there,” he said. Manderville stressed that having a fiscal plan is key to not over-spending in government. “It is all about fiscal responsibility and having a plan in place,” he said. He added he hopes to be a steady asset for council. “I am not here to rock the boat,” he said. “I am here to assist and learn and my passion is community development. Community development is not an overnight thing – it takes time. I would look forward to working with council and to add to the great things they have done already. “I look forward to the challenge and If I am elected I will do my best to represent Red Deer,” he said.